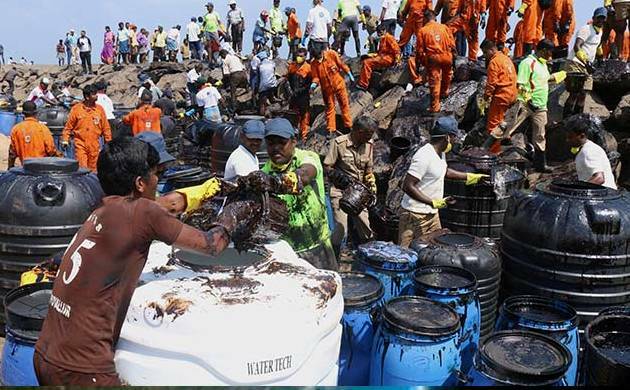 Describing the recent collision of two ships off Chennai coast as an unfortunate incident caused by “human error”, State Fisheries Minister D Jayakumar on Monday said all efforts are being made to remove the slick and maintained that the oil spill from the damaged vessel has been arrested. “It is an unfortunate incident caused by human error. The government is making all efforts to remove the oil slick from the sea,” Jayakumar told reporters here. The collision took place on January 28 at 4 AM when M T BW Maple, with a flag of ‘Isle of Man’, was leaving after emptying Liquefied Petroleum Gas, and M T Dawn Kanchipuram loaded with petroleum oil lubricant (POL) was on its way to berth at the Kamarajar Port, formerly Ennore port. Responding to a query on oil leak from the damaged vessel (Dawn Kanchipuram), Jayakumar said, “the leakage from the ship has been totally arrested. Both the vessels (cargo ships) are right now under the custody of Kamarajar Port Ltd”. On people’s apprehensions about consuming fish caught by fishermen, Jayakumar reiterated his stand that it was safe to consume as fishermen normally fish in deep sea than in shallow waters. “I have been saying this many times. Generally, fishermen undertake deep sea fishing. It is not true that fish are caught from shallow waters,” he said. He warned that action would be taken against those spreading rumours on social media like Whatsapp that it was not safe to consume fish. “We have been testing the fish. We also have a team from Tamil Nadu Fisheries University which has confirmed that fish is safe to be consumed,” he said.